Boots. One of my favourite take-away food options is the Boots meal deal, based around their vegan hummus, carrot and coriander sandwich on tomato bread. 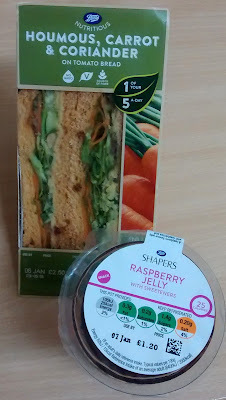 It is probably my favourite commercial sandwich and whilst in theory I can make it at home, Boots does it so well that my efforts don't quite match up! You can buy the sandwich on its own for £2.50, but for £3.49 you can get the sandwich, a snack and a drink. In an example of good marketing I tend do that when I'm making a purchase. There are heaps of vegan snack options, including Clif bars, Trek bars, Naked bars, crisps, popcorn, dried fruit and nuts, and also fresh fruit. Their sugar free jelly is also vegan and I like that on occasion. Pret a Manger. 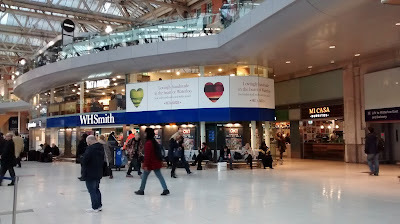 If you want to sit down to eat, there is a Pret a Manger at Waterloo which always has some vegan options. Sadly Pret have stopped making a vegan baguette I loved a few months ago, featuring red pepper tapenade, but their 'super greens and reds' sandwich is vegan (containing avocado, pepper tapenade, kale and toasted almonds). They also have vegan-friendly salads and hot dishes, plus smoothies and juices. It's a nice Pret to sit in as you can look out over the concourse. Wasabi. If you're not into sandwiches, how about some vegan sushi? 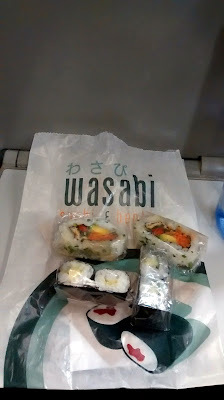 I love the Wasabi range because they sell individual pieces of sushi and you can combine flavours to suit. My favourite vegan options are the mini sushi rolls with cucumber and avocado, and the standard sized rolls with tofu. However, there are also bento boxes to choose from if you want something more substantial. Lola's Cupcakes. Dessert. No self-respecting vegan food source would miss it. Waterloo provides with Lola's Cupcakes, which have a stall downstairs from the main concourse by the entry to Waterloo underground station. As with the other branches of Lola's, there is always at least one vegan option on offer, and usually more. 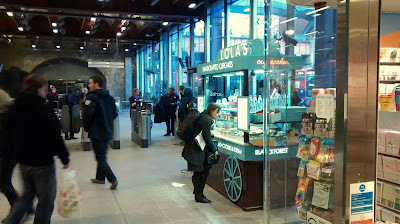 The Waterloo kiosk tends to have three: a strawberry and coconut cupcake, a chocolate cupcake, and a chocolate brownie. If you plan to visit regularly, don't forget to pick up a loyalty card - after 9 purchases they will give you a product and hot drink free. I am not up to a freebie yet, but it will be a glorious day when I am! I have had the strawberry-coconut cupcake, above, and found the icing as decadent as cupcake icing ought to be (which means you probably don't want it too often) and the cupcake to be light and fluffy. 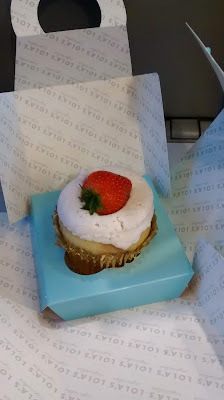 The strawberry-coconut flavours were largely in the icing and to me the cupcake tasted just of vanilla. 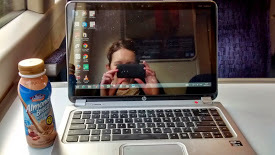 I've also tried and enjoyed the chocolate brownie, which managed an excellent mix of firm (outside) and chewy (inside). Marks and Spencer. If you need to recover after too many cupcakes or brownies, head back upstairs to the M&S Food Hall. I think all UK residents know of its offerings, but in case you're unsure of the vegan selections, some of my favourites are the salad packs (especially the nutty superfood salad), dried apple crisps, and fresh tropical fruit selections (especially in mid-winter). If your blood sugar has dropped again, their iced and spiced fruit buns are also vegan. WH Smith. I wouldn't usually think to pick food up from this stationary and magazine chain, but the train station stores offer meal deals of their own and there is a vegan falafel sandwich in the offering. For me, it doesn't rival the Boots hummous option and so I don't buy it often, but it's good to know it's there. I haven't even ventured into drinks territory, but rest assured you can choose between soya lattes from Costa, Caffe Nero and Starbucks. I am not a pasty fan myself, but if you are, I've also heard of vegan options at the Cornish Pasty Co.
All in all, you won't lack for choice at Waterloo! Do you have any local stations or other centres that are particularly well equipped with food options? Whaaaaaa Lola's Cupcakes has vegan options?! You mean I've been walking past them all these times not knowing that?! Consider my life changed for the better and cakier! That is amazing how much option you have in a train station - I wonder if we could offer comparable (though I know Flinders St Station has lord of the fries but don't know about much else) - I think I have only ever raced through Waterloo rather than lingered. It sounds more like our airports which have quite fancy options now. Am quite fascinated by those small sushi that you can buy individually - would love that but never seen them here - they look like they have more packaging than in Australia but would be great for variety. 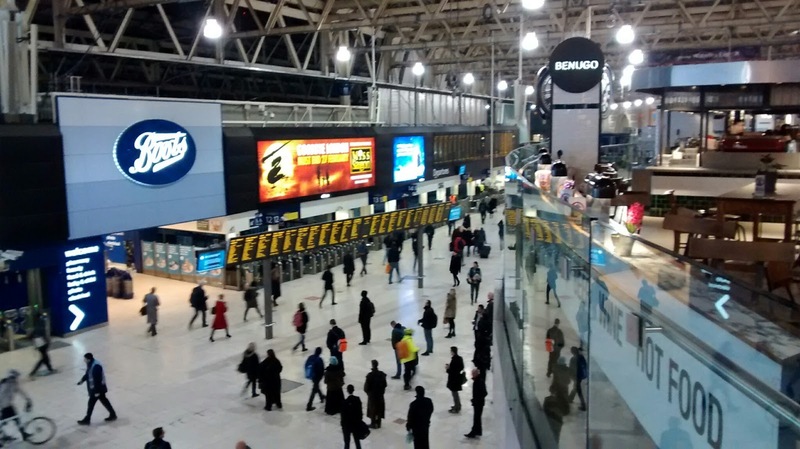 The train stations in London are definitely in a different category to the train stations in Perth (where often your best bet is a bakery and vending machine). Airports are a good comparison. Like you say, the individual sushi packaging is a bit wasteful but I too love being able to buy just a few pieces and/or mix and match them. It's good to see how many options there are. I haven't been to wasabi since being a veggie, so it's nice to see that there are choices. We are really spoilt here! I know, we're very lucky (and well fed)! Holy vegan options Batman! This is amazing. I would have never expected a train station to have all of this. The sushi from wasabi sounds good. And the super reds & greens sammie from Pret a Manger sounds super delicious! I love how easy it is to be vegan in the UK! Wasabi is my go-to station snack but I'll be getting in on the cupcake action next time I'm back.